Enlisted the devices, softwares, and application I use on regular basis to accomplish my work and have productive day. Primarily working on Macbook Air and have a OnePlus One phone. Last year I’ve upgraded my operating system from Windows 7 to Windows 10. I’m now I became a great fan of Windows 10 as well. But, I didn’t like the intermediate versions, 8 and 8.1. After upgrading to Windows 10, I was getting compatibility issue with the software for which I found few alternatives. I’ve tried to list out the best software that can help to use Window 10 at ease, however, feel free to comment and suggest the software that you found more useful. Update: I purchased a MacBook Air after two months long wait. I can feel the power of it, please do forget to watch the video below. What’s your favorite on your machine? I mostly use my Dell Windows 10 laptop for browsing as I don’t like mobile browser a much. My default browser is Google Chrome and the secondary browser is Mozilla Firefox. Sometimes for accessing old websites (like corporate sites), I had to use forcefully Internet Explorer, but that’s very rare. I’m not a great fan of watching movies or series on my laptop, however, this can be once’s favorite pass time. I personally use VLC media player for playing videos. However, for offline music (MP3 only), I still prefer inbuilt Windows Media Player. Protip: You can play videos or music files even in Google Chrome browser. Just and drop media file in the browser window, and hit the play button. I’m a great fan of Google’s Picasa software(non-Google link), but, very sadden after they have discontinued the product. I still have Picasa as my primary photo viewer and even use it for applying different filters. For photo editing, I use GIMP software but basic editing I still find using MS Paint a convenient option. Earlier, I used Microsoft Office 2007 version, however, after switching to Windows 10, I started using Office 365 (2016) version. It’s very much similar to an older version, but with more inbuilt feature and function. I also prefer using Libre Office – an open source alternative software. However, the +1 for MS Office 2016 version. I also like their online Hotmail mailbox. I still love using Skype due to video and audio clarity. However, Google Hangout as Chrome extension even works better option. Since I am very browsing addicted and spend most of the time on the internet, Google Chrome is my best choice. 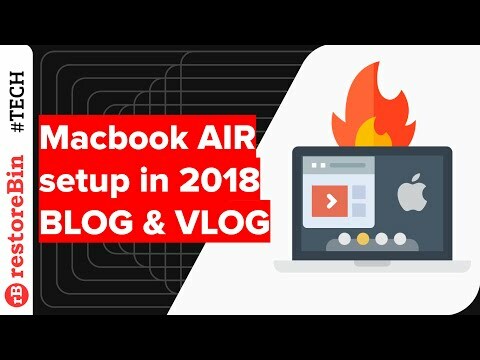 I’m also planning to get MacBook very soon, I got MacBook Air in Amazon Prime Day sale 2018, and I hope these all software are available in Apple Store as well. Please watch the video showcasing the how I’m gonna use this machine. I’ll be updating the list whenever I found some great useful software or app. Meanwhile, do not hesitate to drop your own recommended list below. If you've any thoughts on Devices, softwares, and application that I personally use for productive work!, then feel free to drop in below comment box. Also, please subscribe to our restoreBin YouTube channel for amazing videos tips. Cheers!